Earlier this week, my family and I were invited to a screening of Cars 3. Although our seats were complimentary, all thoughts and opinions about the movie are my own. Amazon affiliate links are used in this post. I remember, back in 2005/2006 when I saw the trailers for the first Cars movie. Even though I had a 5-year-old boy at the time who was the ideal age for a movie all about cars, I had a hard time picturing how *I* would enjoy a movie with talking cars. I decided to trust Pixar’s track record (I had loved everything they’d released, so why wouldn’t I love this one?) and Cars certainly didn’t disappoint. That little 5-year-old boy is now a tall 16-year-old who is learning how to drive, and I had no doubts that Cars 3 would be a family favorite. I have to say that Cars 3 brought the story line back to the heart and soul of the original movie, and I absolutely loved that. Cars 3 is rated G and 100% appropriate (and entertaining) for even the youngest child, and it has a message that can be appreciated by kids and adults of all ages. I found myself really touched by the message of this movie. It took a turn that I wasn’t expecting that left me feeling all warm and fuzzy. Now that I have teens instead of young kids, I love finding animated movies that are still equally entertaining for the older crowd. My husband was especially impressed with the movie and commented after the screening that he was laughing throughout the entire movie. I think Cars 3 will take a place amongst other timeless feel-good sports movies because its message is universal amongst athletes in all sorts of fields. Athletes tend to have short careers, with retirement often coming around 30. That means that they have their entire life ahead of them when their careers are over. It must be tough to essentially start over and find something new to fill not only their time but their passions. I saw Cars 3 in 3D, but for this movie, I’d say you won’t miss anything important if you decide to go for the regular showing. I know that some of my family members have a hard time with 3D glasses and I always like to know when a movie is a must-see-in-3D event. My recommendation: definitely see Cars 3 in theaters, but save your extra cash for some popcorn! Did you know? “Cars” (2006) and “Cars 2” (2011) took in more than $1 billion in combined worldwide box office. Did you know? “Cars” won a Golden Globe® for best animated feature film and two Annie Awards for best animated feature and best music in an animated feature production. Composer Randy Newman won a Grammy® for best song written for motion picture, television or other visual media (“Our Town”). The film was nominated for an Oscar® for best animated feature film, as well as best achievement in music written for motion pictures, original song (“Our Town”). Cars 3 Printable Activities for Kids of All Ages! To print off the activities below, simply CLICK the image to get the full-sized PDF version (note: there are multiple pages of each activity – these are simply previews). Enjoy! The wait is over! See Cars 3 in theaters now! Thanks for these activity sheets! My grandsons are going to love them and they can’t wait to see this new movie! 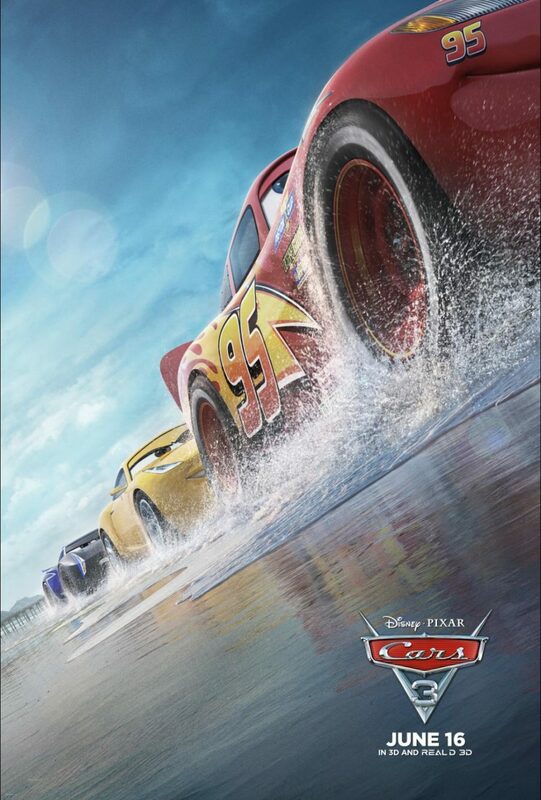 My kids love the Cars movies and this new one is amazing and a fun movie to take the kids to see in the theater! We are excited to see Cars 3. My grandsons will love the activity sheets.